"Shim is a superb soloist, her virtuosity seemingly endless." Thank you Fanfare Magazine for another review for Meerenai Shim's Pheromone! This is an all-electroacoustic album. The inspiration was actually the first track, Fractus III: Aerophoneme (2011/12) by Eli Fieldsteel for “flute and live electronic sound”. Replete with extended performance techniques for the soloist and electronic sounds that seem primal in origin (the Supercollider software was used). There is also the feeling of great expanses around the ten-minute mark, while to the present writer at least the subsequent effects around eleven-twelve minutes in seem to evoke some sort of post-nuclear wind. Shim is a superb soloist, her virtuosity seemingly endless. There is virtually no gap between the end of the Fieldsteel and the wonderfully titled Huge Black Canvas Neck Tattoo by Gregory C. Brown (2014). This piece, for alto flute and digital delay (using Ableton Live software) is, despite the images evoked by its title, much more approachable. Tape loops as used by Stockhausen spring to mind as the lines accrue and begin to interact and co-mingle; the very lowest register of this flute is so resonant it comes across as a bass flute, although only alto flute is credited. The busier sections are remarkably effective, as are the whimsical, flight moments elsewhere. The same software is used in Douglas Lausten’s 60.8% for bass flute and electronics (2014). The title refers to the unemployment rate in Greece and the piece is inspired by the hardship encompassing the Greek nation of late. The ghost of rebetiko music underpins the material, while the Greek flavor is unmistakable. Elusive and soft textured, Emma O’Halloran’s Pencilled Wings, also of 2014, features pianist Jacob Abela (on a Yamaha concert grand). The soft-grained stereo playback audio file that underpins it all creates this relaxing ambience. The piece from which the album gets its name, Pheromone by Isaac Schankler (2014) is for flute (standard and bass), piano and electronics (MAX/MSP). The piano’s contribution is initially very gentle, and beautifully managed here; the piece gradually slows to a meditative space before inviting in frenzy. Finally, Matthew Joseph Payne’s Etude for contrabass flute and TI83 Plus graphing calculator. Shim records audio directly from the calculator. There is a quite involved story of how the piece came to be a half-step lower and slower than the original because of a memory leak bus destroyed the original calculator part before the composer recorded it. What we really need to know, of course, is that the piece is phenomenal fun. Brief and to the point, it is also wonderfully unique in feel. Somewhat otherwordly, some might feel; others may find it links to computer game “soundtracks” (if so they could be called in those days) of the 1980s. 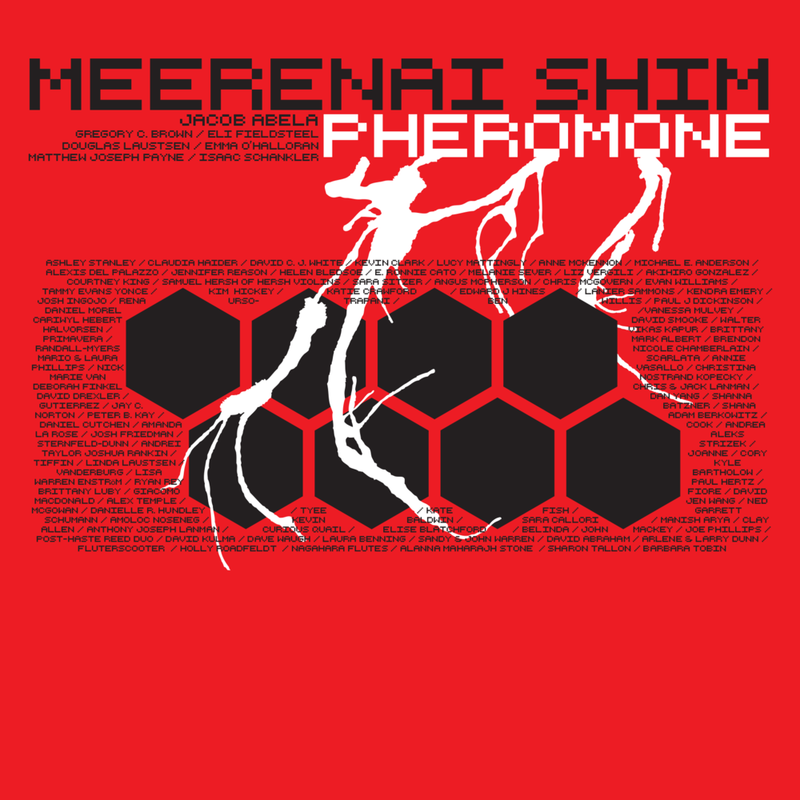 Pheromone: "wide-ranging in style and timbre, extraordinarily inventive, often wildly entertaining, and not for a minute dull"
Another great review for Meerenai Shim's Pheromone! As is often true of new music in the classical sphere this program is eclectic and owes as much to jazz, folk, and popular music, as it does to any tradition handed down through the concert and recital hall. All pieces are commissions, except the Eli Fieldsteel work, made by San Jose-based flutist Meerenai Shim for this first release on her new indie classical label, Aerocade Music. The music is all electroacoustic, with instruments ranging from the standard C flute to the behemoth contrabass two octaves lower. The electronic accompaniment is provided by a number of sources: fixed media, real-time audio synthesis using SuperCollider, Ableton Live, and Max/MSP, and the output from a Texas Instruments graphing calculator running sequencing software. (Who knew?) To those who do not follow electronic music, this may all sound like gobbledygook. Bottom line is that the electronics provide an orchestral palette of sounds, almost infinitely malleable, and capable of either responding within preset parameters to what the performer is doing, or creating a rich setting to which the performer can respond. Received concepts of electronic music don’t apply. Expression of human emotions is very much the purpose, and it is in this that Shim, pianist Jacob Abela, and the various composers have excelled. Fieldsteel’s Fractus III: Aerophoneme, whatever the method used to achieve it, is a dramatic unfolding of cooperation, conflict, hope, and eventual dissolution with the electronics as the often menacing rival. Gregory C. Brown’s Huge Blank Canvas Neck Tattoo for alto flute and digital delay reflects on personal setbacks and triumphs in the composer’s life. In it, statements made by the soloist become the background—often enhanced—for future discourse. Emma O’Halloran uses a “tape” track and piano duo to accompany—and sometimes overwhelm—the flute’s fantasy flights in her Pencilled Wings. Douglas Laustsen’s 60.8% for bass flute and electronics ponders the devastating impact of unemployment on the youth of Greece since the imposition of austerity, using, as an inspiration, rebetiko, a once disreputable style of 20th-century Greek urban folk protest music. Schankler’s Pheromone deals, logically enough, with attraction and bonding, and Matthew Joseph Payne’s quirky Etude for contrabass flute and TI83+ calculator is, with its combination of low-res early video-game-like sounds and the mellow contrabass flute, two minutes of unadulterated nerdy delight.